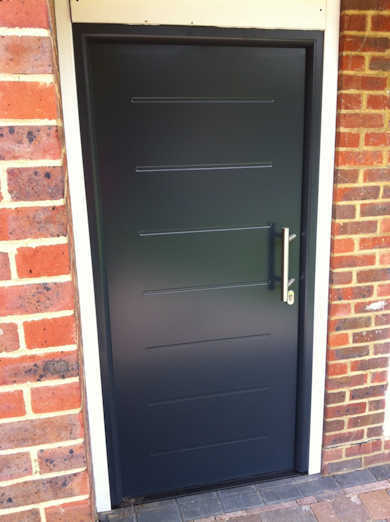 A fantastic product from Hormann the ThermoPro and ThermoPlus front doors are a smash hit!! 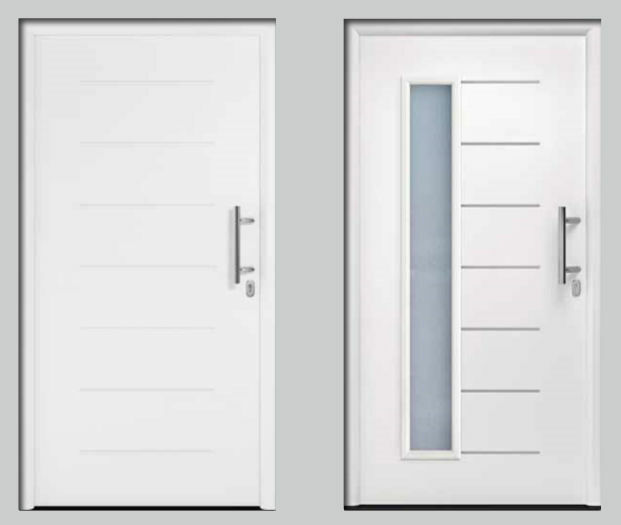 Very high security 12-point locking, high thermal properties and with prices from £1100 inc VAT and delivery.... that's hard to believe. Both modern contemporary and classic designs are available with sizes to suit standard UK openings and also made to measure sizes available to special order. 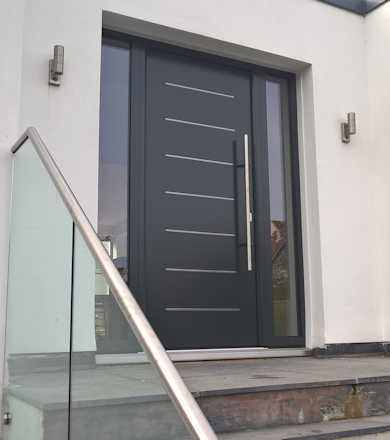 Great in their own right... they are also an excellent match for Hormann's high security, no compromise sectional garage doors or garage personnel doors. 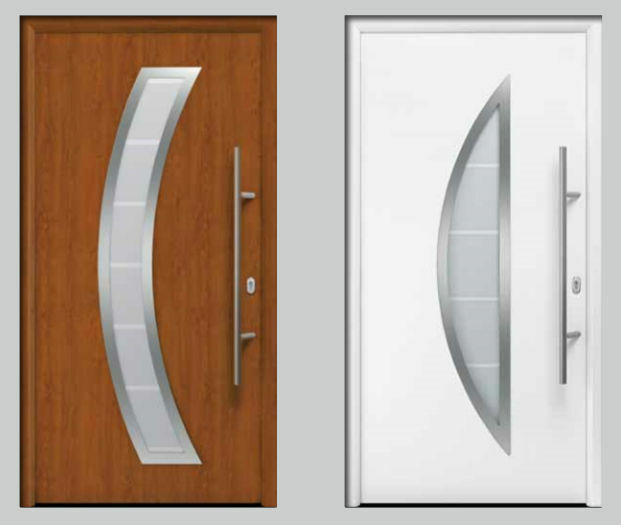 Side Elements and Transom Light (window at the top) are also available. Hormann have an excellent reputation both for making high quality products and supporting them well. Technical support, service and warranty backup are all outstanding and this gives us the reasurance that we are selling a good product with good warranties that isn't going to let you down. 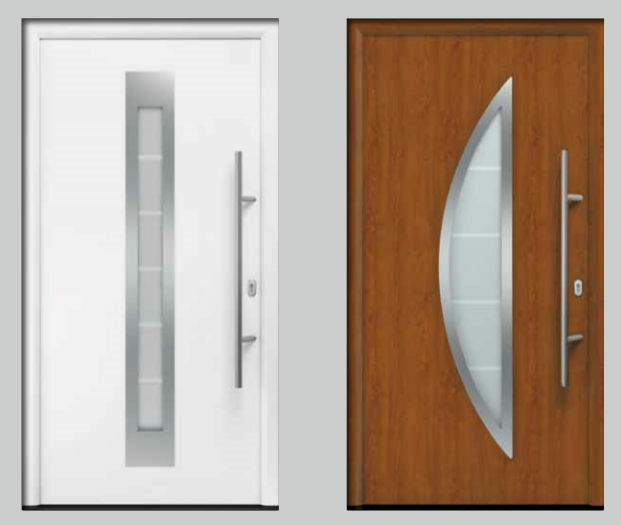 TPS515 front door with small stainless steel handle, optional stainless steel look embelishments and sand blasted side elements. 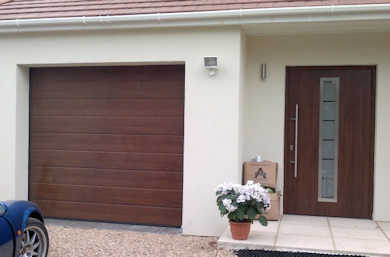 An ideal match for an LPU40 L-Ribbed sectional door. So what is the difference between a ThermoPro (TPS) and a ThermoPlus (THP)? The main difference is the thickness and therefore u-value. 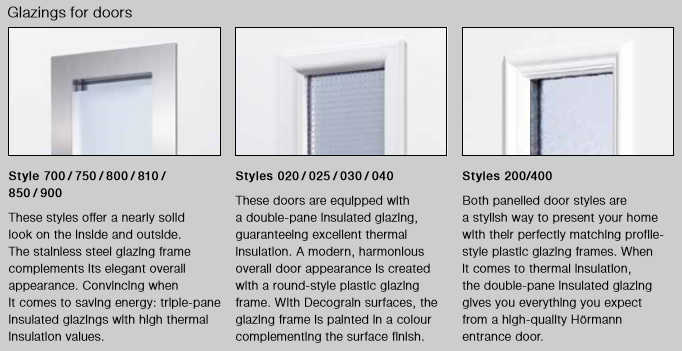 ThermoPro's are 46mm thick with u-values down to 1.1w/(m2k)using an frame frame with thermal break and double glazed Side Elements, whereas the ThermoPlus is 65mm thick with u-values down to 0.87w/(m2k) and has a frame with an insulated portion within it and Side Elements which are triple glazed. 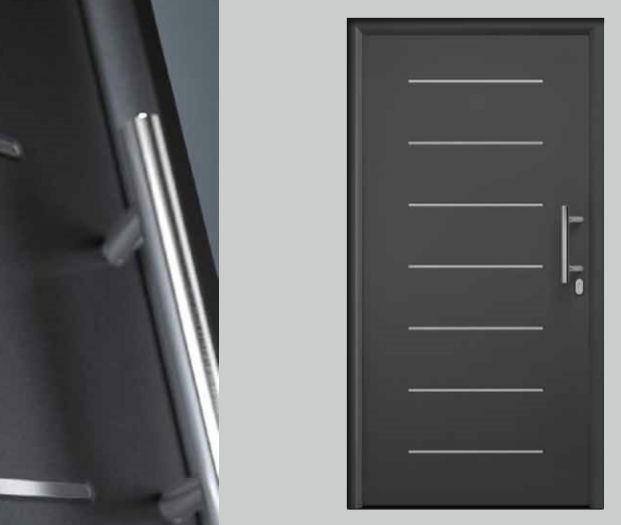 Security is excellent on both doors but the hinge side of the ThermoPlus door leaf fully engages into it's frame. Lastly a few extra options are available on the ThermoPlus - inside and outside differing colours, etc. 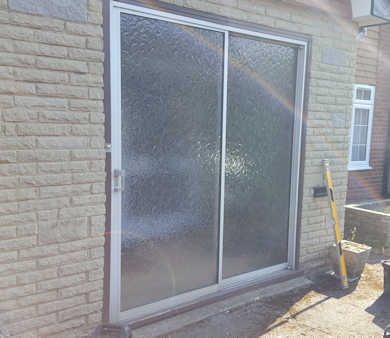 Steel door leaf with Aluminium frame with double glazed insulated windows. 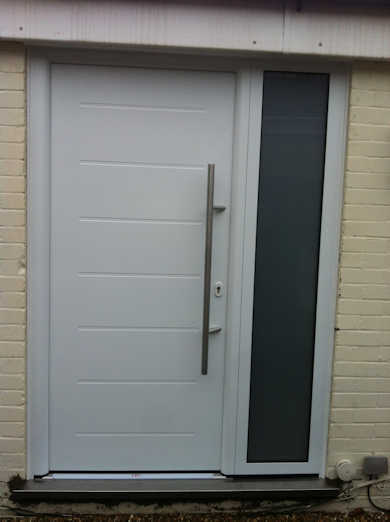 Polycarbonate glazing surrounds and stainless steel fixed handles. 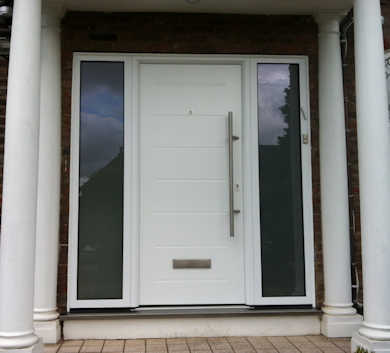 Steel door leaf with Aluminium frame with double glazed insulated windows. 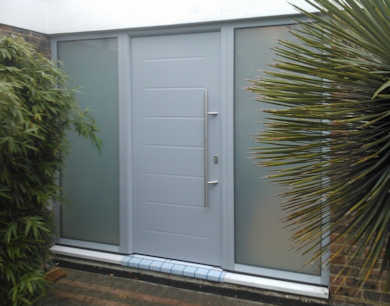 Polycarbonate glazing surrounds and small stainless steel fixed handles. 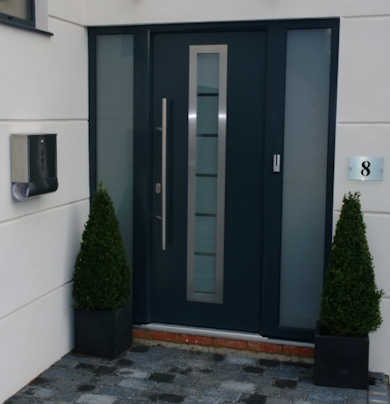 Steel door leaf with Aluminium frame with triple glazed insulated windows with sand-blasted pattern. 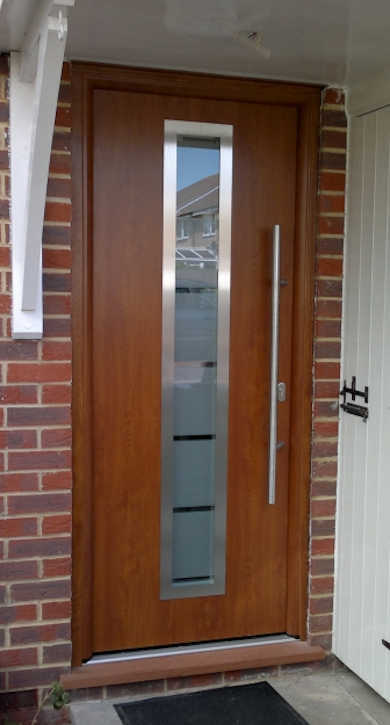 Stainless steel glazing frame, large stainless steel fixed handles. The various styles are shown below. glass, sand-blasted with clear horizontal stripes. 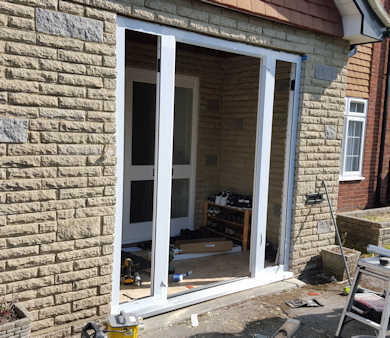 Stainless Steel glazing frame. ThermoPro U-value up to 1.2 W/m2K. ThermoPlus U-value up to 0.95 W/m2K. 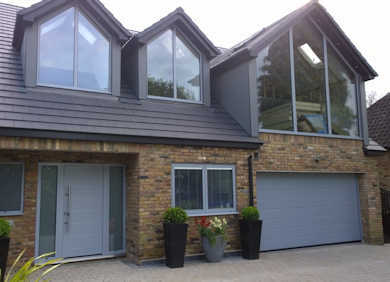 Shown here in Grey Aluminium RAL9007. Shown here in Golden Oak. ThermoPlus U-value up to 0.93 W/m2K. ThermoPlus U-value up to 0.99 W/m2K. ThermoPro U-value up to 1.1 W/m2K. ThermoPlus U-value up to 0.87 W/m2K. 350mm small Stainless steel handle HB 14-2 on steel infill. ThermoPro U-value up to 1.4 W/m2K. 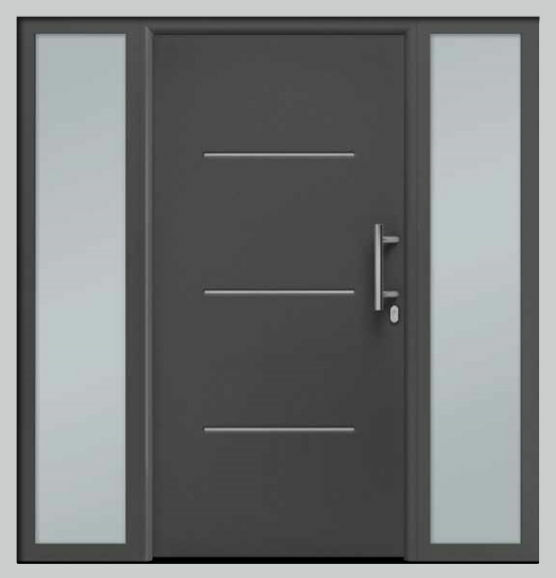 350mm small Stainless steel handle HB 14-2 on steel infill, double-pane insulated glass in Mastercarré design. 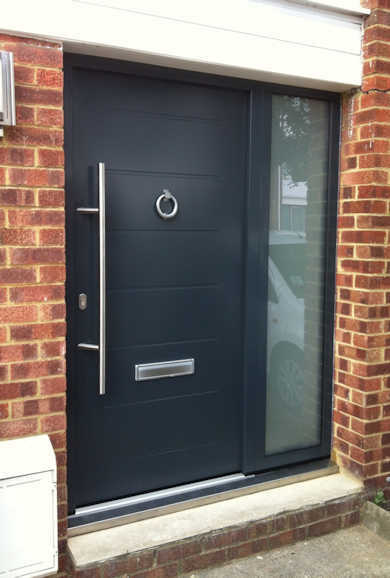 Shown here in Anthracite Grey RAL7016. ThermoPro U-value up to 1.3 W/m2K. 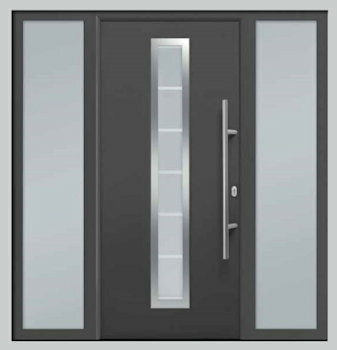 350mm small Stainless steel handle HB 14-2 on steel infill, double-pane insulated glass 300mm diameter in Ornamental glass 504 design. 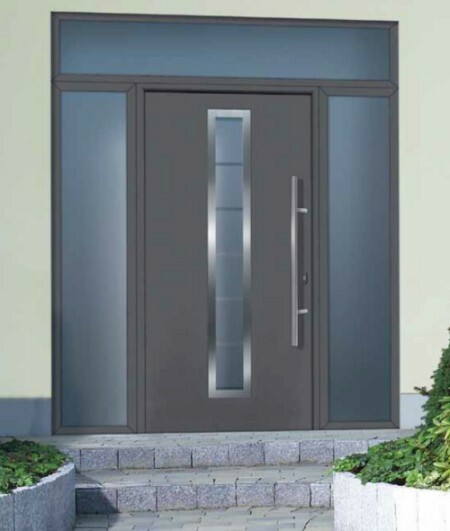 350mm small Stainless steel handle HB 14-2 on steel infill, double-pane insulated glass in Cathedral design. ThermoPro U-value up to 1.0 W/m2K. ThermoPro U-value up to 1.5 W/m2K. 350mm small Stainless steel handle HB 14-2 on steel infill, triple-pane insulated glass in Sand-blasted with clear stripes design. ThermoPlus U-value up to 1.0 W/m2K. 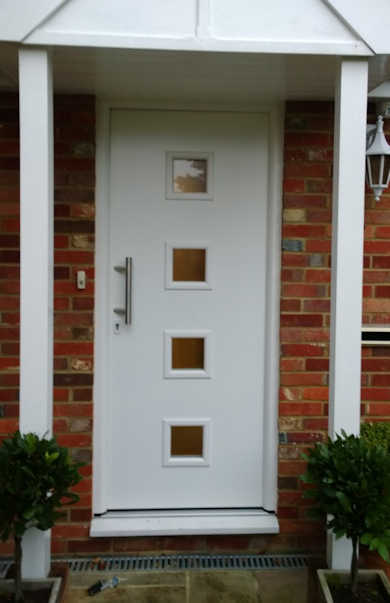 Side Elements and Transom Light (window at the top) are also available, Double or Triple glazed. 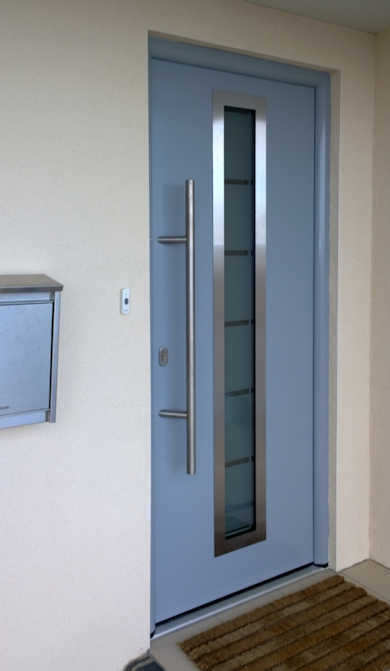 Letter box, spy hole options in some doors and letter box also available in horizontal break in Side Element over 450mm wide. 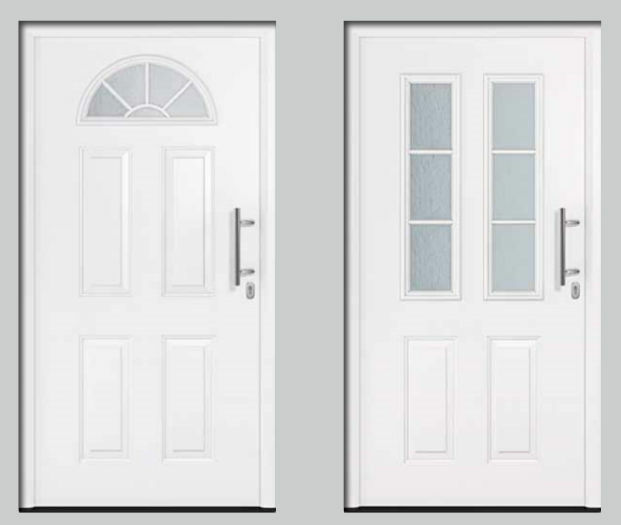 THP410, 430 and 450 only available in Traffic White. 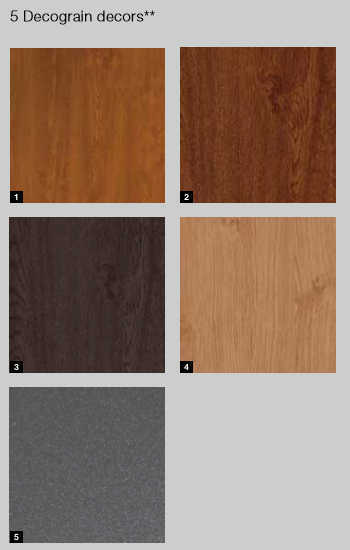 THP100, 410, 430 and 450 not available in Decograin finishes. TPS100, 200, and 400 not available in Decograin finishes. 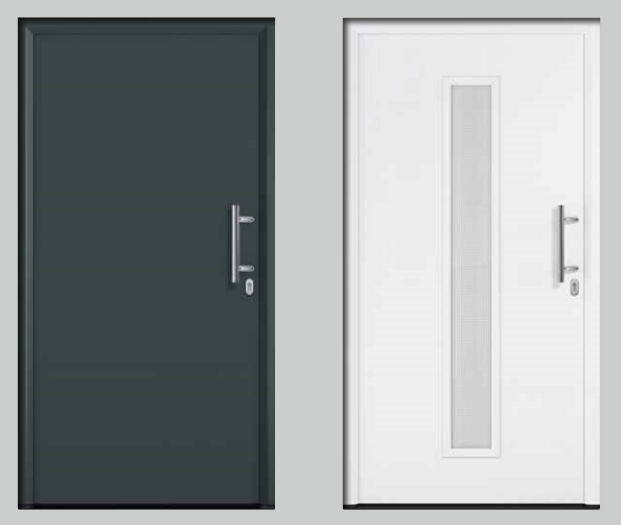 TPS020, 025, 030 and 400 polycarbonate glazing frames painted to match door colour. 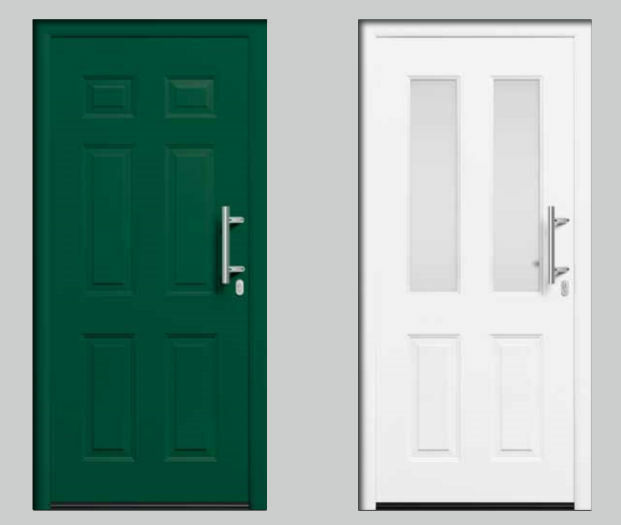 All doors - internal colour the same as the external colour.... 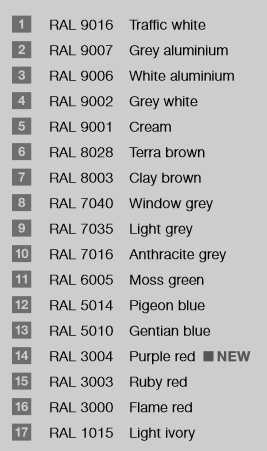 EXCEPT... THP010, 015, 515, 700, 750, 800, 810, 850 and 900 Golden Oak, Dark Oak and Titan Metallic can be specified with a Traffic White inside (+£100). 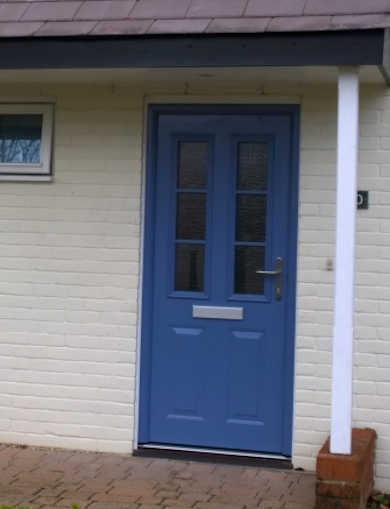 Frame colours - all TPS and THP doors can have the frame a different colour to the door. 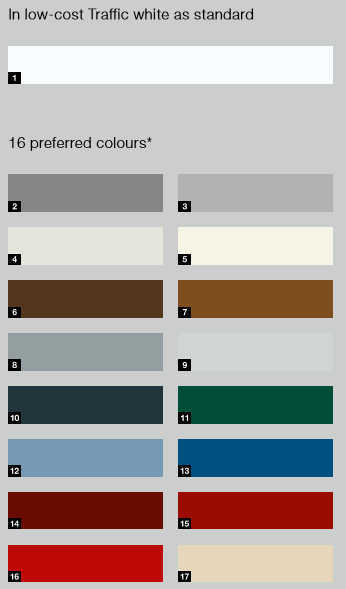 Special colours are not available in the ThermoPro or ThermoPlus doors. 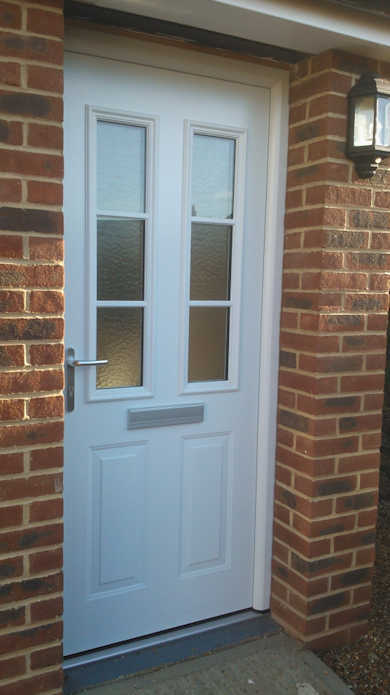 Available either with glazing in a finish to match your door or in solid infill. 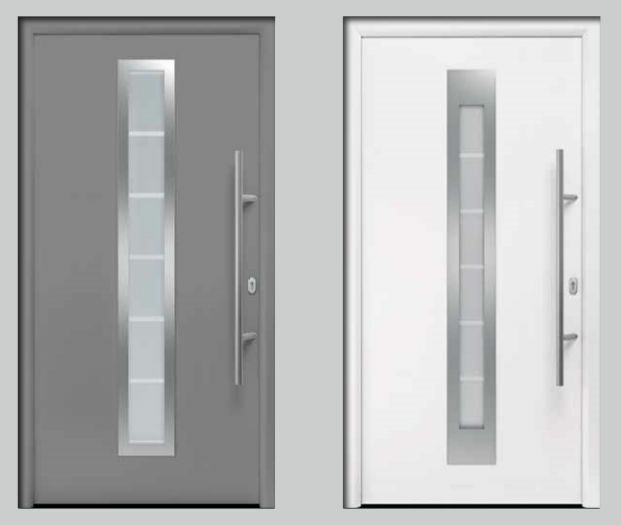 Long stainless steel (1000mm) and short stainless steel (350mm) handles on doors as specified above can be swapped for £110 inc VAT, or can be replaced with a ES0 lever/lever stainless steel handle for £110 or swapped for ES1 lever/lever stainless steel handle for £280. Various security enhancements and key also available. 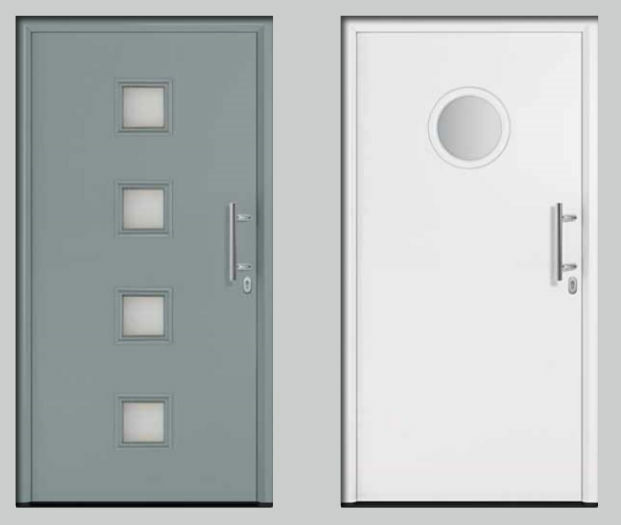 Electric locking is available controlled either by remote control, finger scanner or number pad on THP doors. 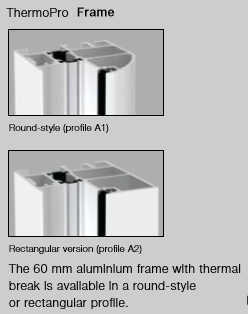 Frame extensions in 25mm or 50mm widths for ThermoPro or 50mm only for ThermoPlus. Can be used at the sides or across the top. 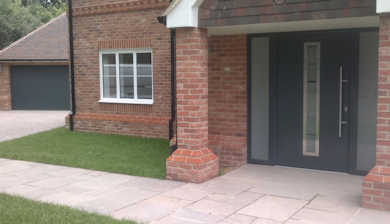 As standard doors come with low threshold for disability access but if you are renovating you may need a sill. 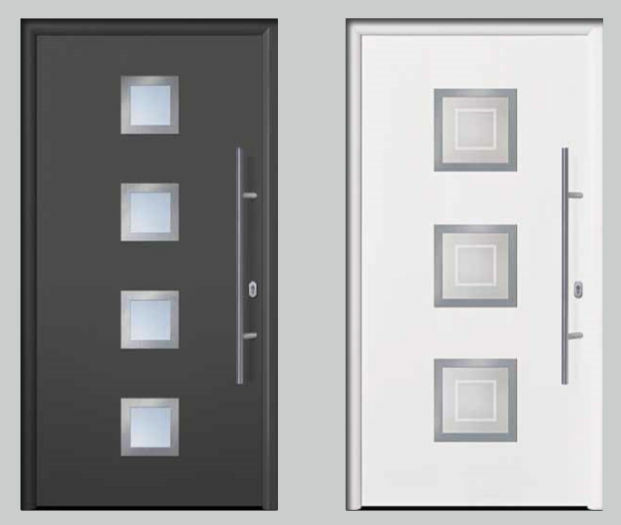 We cn supply the following: Sapelle, Sapelle cloaked in stainless steel, oak, Aluminium (white, black, Anthracite). 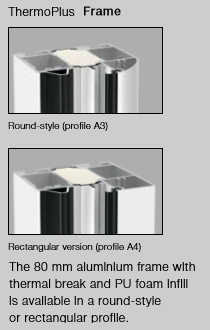 Hormann also sell various spacers that can fit under the thresholds. Secured by Design in conjunction with the Association of Chief Police Officers, is a security upgrade to help combat crime. 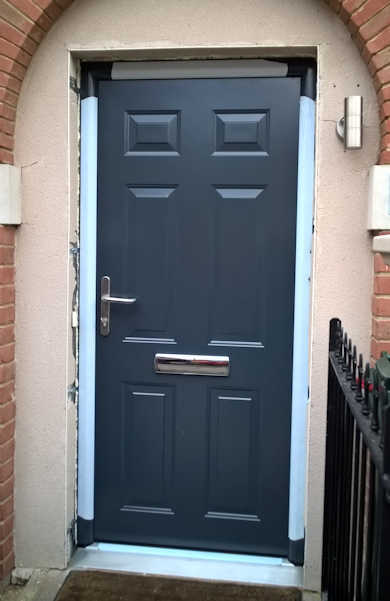 The fully accredited door will come supplied with a high security cylinder complete with registration card and 3 security keys. £100 inc VAT. Delivery is currently 6/8 weeks. 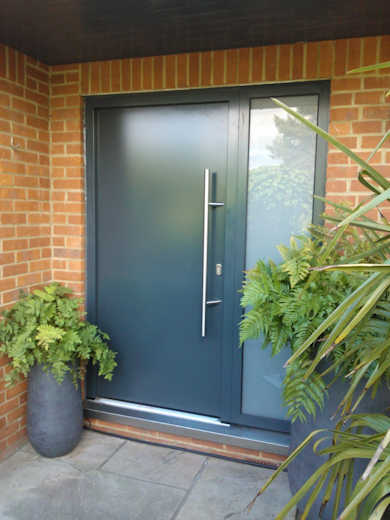 ThermoPro and ThermoPlus doors come pre-fitted within their own frame therefore the ordering size refers to the external dimensions of the frame. Both standard and made to measure sizes are available. 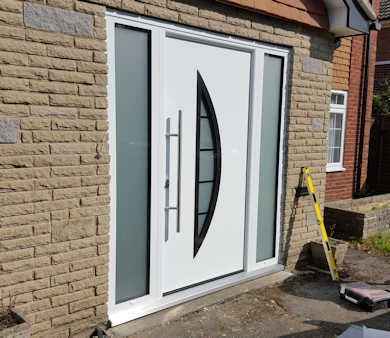 Ensure the brick opening is perfectly square (the doors are) and allow minimum 5mm clearance either side for variances in brick/blockwork plus space for manouvering the product into place. Hormann offer a full 5-year manufacturers warranty that covers both parts and surface finish. Normal reasonable wear and tear, wilfil damage, etc, is excluded and products must be installed as per installation instructions. 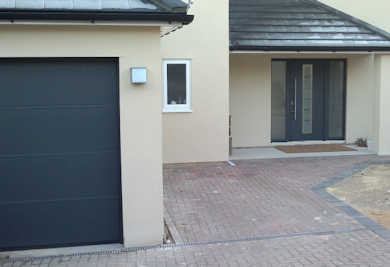 ThermoPro & TheroPlus front doors have been purposely made to matching with Hormann's range of sectional garage doors. 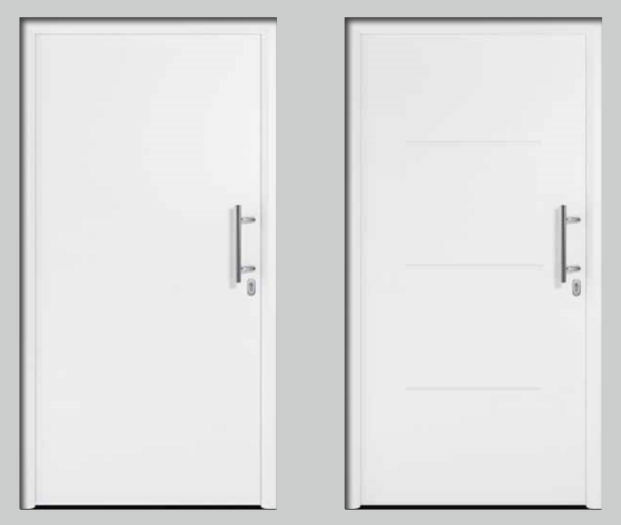 Check these out on our Hormann Secitonal Door pages. Call 01342 301811 to place your order. Delivery is free of charge. 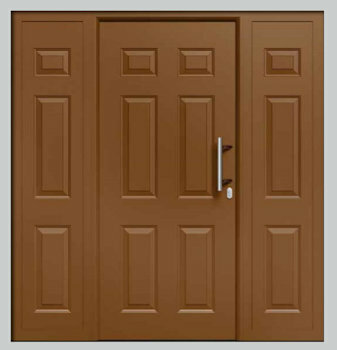 Prices include VAT - Prices for standard doors only. 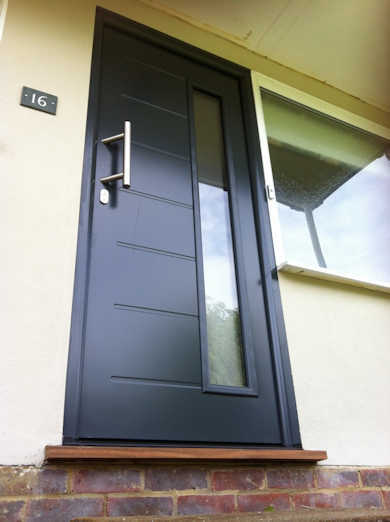 To price a frame in a different colour to the door use the Decograin price if door or frame is in a Decograin finish otherwise price as a coloured door.